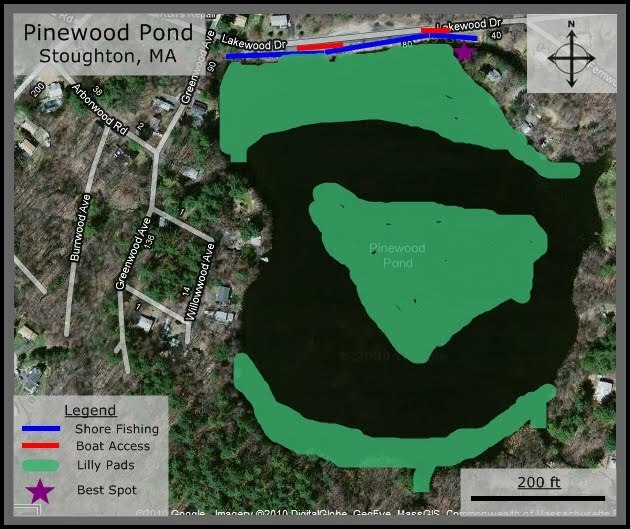 Stoughton's Pinewood Pond, also known as Harrison's Pond, is a decent sized fishing hole near the Canton town line that is very challenging, frustrating, and constraining. By the middle of the summer, it is absolutely covered in lilly pads which makes it very difficult to get your bait down to the fish. You're best chances are to get to this pond early in the year during the prespawn period if you want to catch some good size bass. Unless you live on the pond, all of your shore fishing will be down from on the northern shore of the pond from Lakewood Drive. There are some tall reeds along the shore so finding a spot to fish from can sometimes be tough but there are enough openings. If you're going to fish from the shore, my suggestion would be to start on the north east corner where there is a point to fish that is always stacked with bass. (I'll mark it with a star on the map.) Working down the shore to the right is always what I've done whenever I go there. As I mentioned before, the lilly pads are very thick so the key here is to find a few spots where they open up and drop your line in there. My best tactic has been always to cast it long and slowly creep my bait up to the opening so by the time it drops in the fish have seen it coming for a while. If you're going to drop you're boat in there are plenty of spots to fish but you better do it in the early spring or you won't be able to move. The spot that seemed to produce the most fish was on the eastern shore, where there is a little cove. You are almost fishing the bass out of a couple of backyards but the water is warm and shallow and clear of any weeds so it is perfect for spawn beds. Successful Bait: Worms- Watermelon, Red, Brown, Black w/ blue flakes. Frogs- Green/Yellow, Dark Green. Mice- White, Grey.